As a fifth Generation Londoner I have London in my blood! I have an infectious enthusiasm to share my store of knowledge especially revealing some of the less frequently visited parts of Westminster. I have a special interest in 18th & 19th century Westminster and the developments that occurred which have shaped the Westminster we see today. 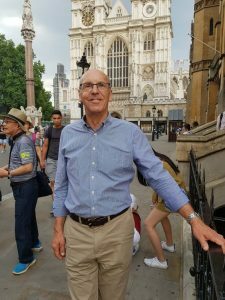 I’m a qualified Westminster guide , also greatly interested in the City and enjoy leading walks around both areas. As the seat of government Westminster has a heritage and personality distinct from the City with its traditions of trade and finance. Both are endlessly fascinating.